Before my second trip to Mongolia in 2006, I decided that I both wanted and needed to learn at least a little of the language since I was going to be traveling on my own for over three weeks with only Mongolian guides and drivers. The guides, at least, speak decent English, but I was going to be finding my way around Ulaanbaatar on my own part of the time. I advertised in our local news/art/culture weekly for a Mongolian tutor (in rural Humboldt County, California?) and, guess what, I got a phone call within two days. Seems a woman from Mongolia, who had met and married an American guy who was there serving in the Peace Corps, was at a party with her husband and a number of people asked them if they had seen the ad. It turns out that she had only been in this country for a couple of months, so her English was still very uncertain. He called me and we set up a meeting between her and I. It went well and we were able to get together about a half dozen times before I left. Even better, we’ve stayed in touch and become friends with them. She drilled me in basic pronunciation, got me going with some basic vocabulary and taught me necessary phrases like “hello”, “thank you” and “I’m from California”. Her husband contributed a word to use if someone hassled me- “Yasambay!” (sic), which means “What are you doing?”, the idea being that the person would be so shocked at hearing Mongolian from a non-Mongol that he/she would immediately stop whatever they were doing. As it happens, I’ve had no occasion to say it so far. That tutoring, plus a copy of the Lonely Planet phrase guide for Mongolian is what I had until last year. 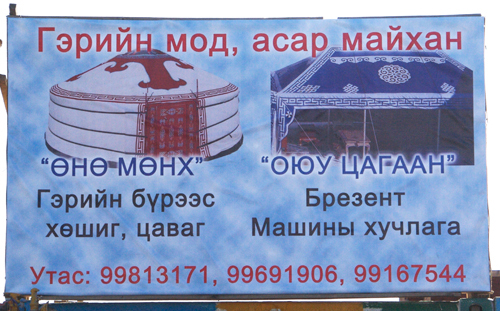 Banner for tent sales, Narantuul Market; Ulaanbaatar, May 2005- top line: "GERIIN MOD, ASAR MAIKHAN" - Geriin is, I believe, the possessive of ger, the felt "tents". 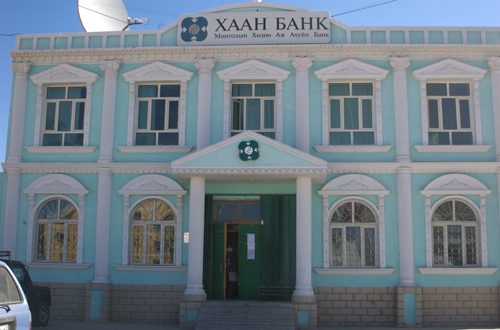 Maikhan are the summer tents; "ONO MONKH", followed by "GERIIN BUREES KHOSHOG, TSAVAG"; OYUU TSAGAAN", followed by "BREZENT MASHIN KHUCHLAGA"; last line "UTAS", "Call:"
After sitting mute, and depending on a translator, during my three days of meetings with the herder women in July of 2009, I decided that it was time to get serious. While I was in Ulaanbaatar I bought Mongolian-English and English-Mongolian dictionaries. When I got home I started to comb the web for a language program and found one from Transparent Language. (None of the other major foreign language companies offer Mongolian as far as I can tell). It is based on word lists that are viewed on “cards”. Each word is in Mongolian Cyrillic and and a transliteration into the Latin alphabet. One can also listen to a male native Mongolian speaker and repeat back each word. It even lets you slow down the speaker so you can hear the word better. There are a variety of other activities like typing out the words and some simple games. I had also bought a small stack of music CDs and rapidly realized that I could use them, too. The perfect two-fer, listen to cool pop and rock music and study Mongolian at the same time. 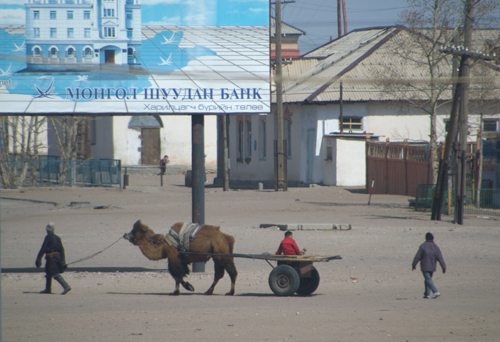 Billlboard; taken from train on the way to Ikh Nartiin Chuluu, April 2005 (I may have started to fall in love with Mongolia at this point, seeing the bactrian camel cart)- "MONGOL SHUUDAN BANK"
But I was still struggling to get anywhere. As it turns out, my husband had to learn Russian when he joined the Air Force (and if I say any more, I’ll have to kill you). He told me the first thing he and his classmates had to do was memorize the Russian alphabet overnight. He suggested that I back up and learn the Mongolian cyrillic alphabet. I managed that in a few evenings and suddenly it got a little easier. I’d started to “collect” words, writing them on a pad of paper. That reached its limit of practicality pretty quickly. I bought a copy of Bento, the consumer-level database program for the Mac and created my own word list, which is divided into categories like English, Mongolian, part of speech and subject (animal, food, furniture, etc.). I can sort my list by any of them, which is very useful and why I bought a database. It will be on my laptop, which travels with me, but I’m also going to print it out in each category to have handy in the car or when I’m walking around. Recently, a commenter on another post told me about Anki, a downloadable program that generates “cards” with whatever content one wants like, say, Mongolian words. This is the same model the Transparent Language package, Byki Deluxe, uses, but those are pre-set. I’ve downloaded Anki, which is free, but haven’t had time to mess with it. Well, that banner was a surprise. Are there actually any collies in Mongolia? I have no idea. Ulaanbaatar, Sept. 2006- "SHINE (new) BARAA (merchandise) IRLEE ("has arrived", I think it means)"
Then a French Facebook friend (say that fast three times) told me about PowerWord, which includes Mongolian as one of their offerings. So, for $8.99, I now have a Mongolian language program on my iPhone, too. It is also based on word lists, like Byki, but so far I think I like the way it’s organized better. It also has a spoken component, this time with a female voice. Of course, the best and fastest way to learn will be immersion in the language once I get to Mongolia. But I hope I’ve “primed the pump” for rapid progress with the study that I’m doing before departure. Chinggis is everywhere; Ulaanbaatar, Sept. 2006- "ENERJI"; the lines above and below the main word are in a script that I can't quite figure out for every letter. The block lettering is easy by comparison. Perhaps buying some Mongolian movie dvd’s and watching them repeatedly might help as well. That is how I improved my english listening comprehension. I do own a few- Story of the Weeping Camel, Cave of the Yellow Dog and Khadak- and that’s a good idea. I’m also thinking about seeing what kind of non-music videos there are on YouTube that would let me listen to spoken Mongolian. Thanks for the suggestion! Bayarla! Good on ya! Btw, “ENERKHI” is actually “ENERJI” (“energy”). The script that you “can’t quite figure out” is just cursive of the same alphabet. Bayarlala! The cursive alphabet makes it harder to tell what the letters are. I hope to work on that on my next trip.